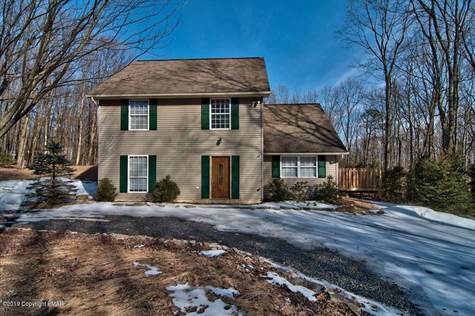 Extraordinary 3 bedroom Colonial located in a desirable Pleasant Valley. Well-kept home has very low taxes and dues. Open kitchen, formal dining room, Den could be 4th bedroom, nice size Master bedroom. Huge deck and above-ground pool for entertaining and gatherings. Beautiful yard and lots of curb appeal. Near many Pocono attractions and shopping. Make an appointment today for your private weekend showing on Friday, Saturday, or Sunday. Would you like more Information or an appointment to seethis property? Please contact Janine Rosengrant at her direct number: 570-656-385, or call Realty Executives: 570-476-2424. Online at www.JanineR.com.